Who doesnt love the idea of free fruit that falls from the sky! 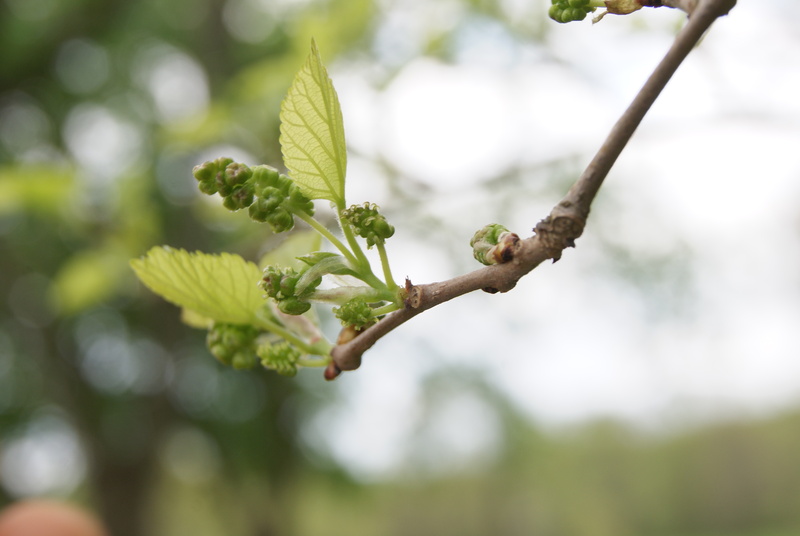 The mulberry tree (Morus spp.) is a beautiful giant with over 300 varieties worldwide. At their ripened stage, the berries range in colors from black, red, white, and purple. 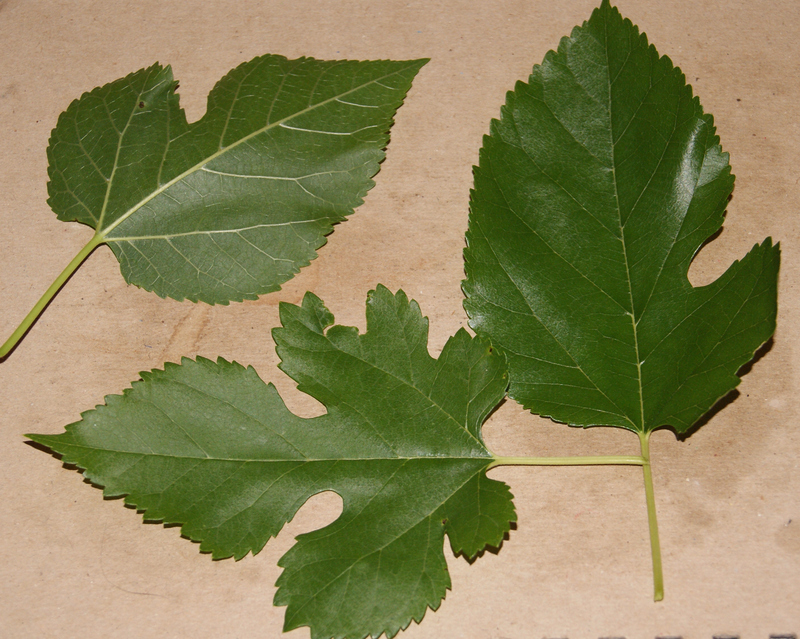 In this article, I will be discussing 3 commonly found species: Morus nigra (Black Mulberry), M. rubra (Red Mulberry), and M. alba (White Mulberry). There can actually be many colors of berry ripened on one tree as they are prone to hybridization, and for the hungry forager, if you’ve got ripe mulberries then eat up and enjoy!! Fortunately for people like me (opportunivores), that leaves a whole bounty of unchecked fruit pouring from the sky waiting to be harvested and shared with friends. Go out and look around! They are more abundant than you think, check neighborhoods, parks, recreation centers and the occasional strip mall (not recommended for harvest). The leaves are actually the sole diet for the silkworm which is why some of the nativeAsian varieties were imported here. They tried and tried to create a silk industry in America but failed. So we have worms to thank for an even greater abundance of local mulberries! Mulberry leaves are also a very characteristic attribute to learning to identify the trees when they are not fruiting since they have a longer season than the fruits, but obviously shedding them too in the winter months. This odd sign on the street is a sign of unrecognized gold! 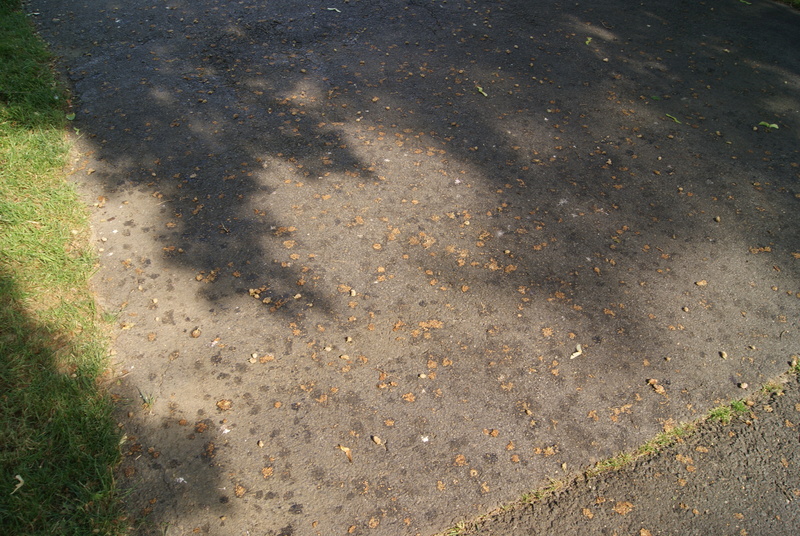 Most would walk past this and see crud on the pavement, but I would suggest, it’s a good time to get on your knees, look up and thank the heavens (or at least the trees) for the glorious bounty you have been offered! 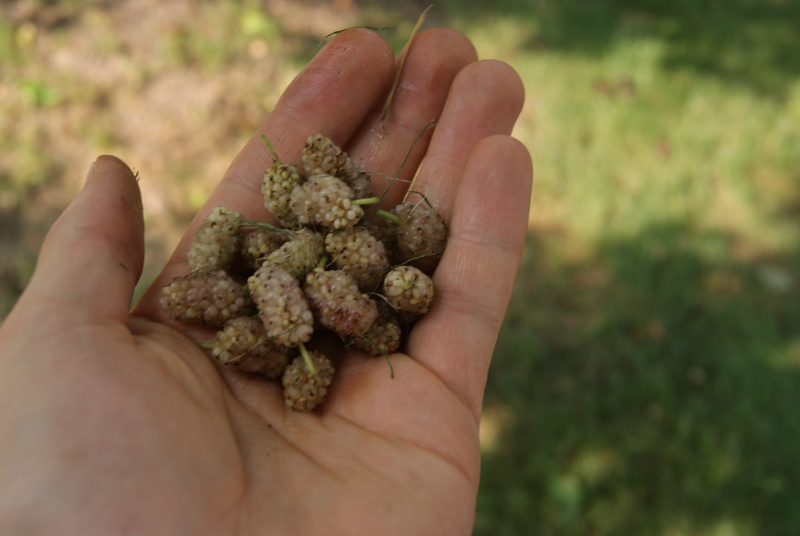 You can find white and red mulberries fruiting in late spring, while black mulberries can be found up until August. Mulberries are so special that they let you know when they are ripe. The best ones to pick are off the ground. That is the trees way of letting you know which berries it has perfectly ripened in offering to the 2 and 4 legged. A great way to collect mulberries is to lie out a tarp or blanket under each limb as you gently shake to allow the ripened fruits to fall. If you pick them from the tree and they don’t literally fall off the tree from touching them alone then they won’t be ripe and you will surely be convinced that your store bought ones have added sugar! If you plan to eat them raw, they have a very short life in the refrigerator, about 3 days (which is why you don’t see them fresh in the store), so don’t collect a bunch and then waste some (bad for the animals). However, you can dehydrate mulberries in the sun, just make sure animals won’t get to them and bring them in at night, or put them in a dehydrator. Once they are fully dry, they will keep all year until next season! Mulberries are very high in antioxidants and help the body cleanse damaged cells that lead to many complications. They also contain large amounts of vitamin C as well as Vitamin K, Vitamin A, Vitamin E, really high levels of Iron, and Dietary Fiber, which all help to give the body and mind incredible energy to live happy and healthy lives! Due to the high energy content and virtually nonexistent fat content, they make a great snack to help lose weight. They are also high in minerals like potassium, manganese, and magnesium and contain the B vitamins, B6, Niacin, Riboflavin, and Folic Acid. Mulberries contain flavonoids and phyto-nutrients and are extremely high in anthocyanins which help to fight against cancer as well as reduce aging and neurological diseases, inflammation, diabetes, and bacterial infections. The berries also contain resveratrol, a powerful blood flow increasing antioxidant which you have probably heard promoted through the wine industry as their new claim to fame (Although many “weeds” such as Japanese knotweed are around 300 times higher). Resveratrol is a powerful healer for many conditions such as aging diseases, inflammation, and a number one go to as part of an herbal protocol for the treatment of Lyme disease (Having had Lyme, I’ve felt and seen those effects). I, of course, always leap at any opportunity to teach more people about wild foods and the ecological importance of caretaking the earth, guitar students included. So when I had discovered an unripe mulberry tree not too far from one student’s house, I was thrilled to get the opportunity to collect some and show them! I harvested only a few as the tree wasn’t ripe, but I knew if she and her mother ate a few, it would unlock a door of realization. As I knocked on their door and presented the few berries in my hands, Esha, my 8 year old student exclaimed, “Those are mulberries? We have them all over the driveway!” Lo and behold, I had just drove under one of the mightiest and heaviest fruit bearing trees I had ever seen! 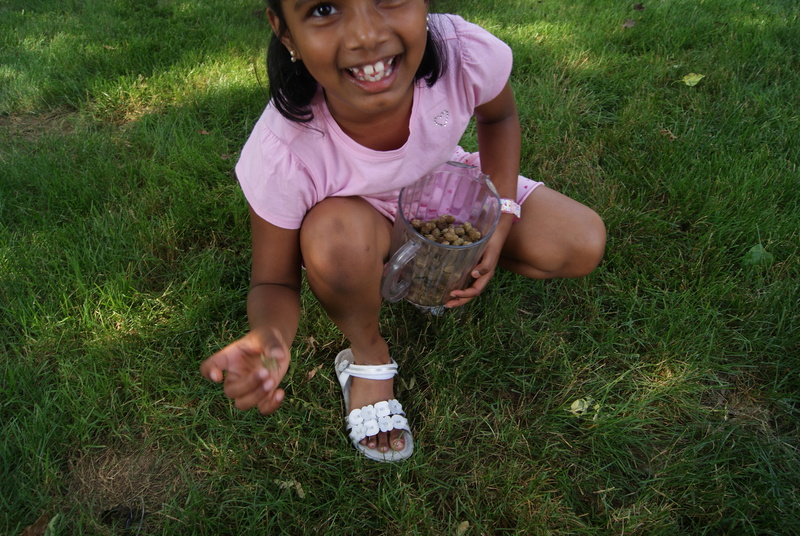 With haste, we all began to joyously scoop up handfuls and filling buckets. I soon saw them sharing in the same ecstasy that I feel when I discover such a treasure trove! Within minutes, daughter, mother, and aunt were scooping up mulberries along with me! They had dropped all inhibitions and forgotten that people might think they were weird for picking stuff up off the ground and eating it in their “normal” neighborhood. It opened them up to the wild of the world. They were ALIVE!! Soon, Esha’s mother was spreading blankets on the ground for easy collection the following day while they all were picking away! Joy and shock was beaming over their faces. It couldn’t be this easy, could it? 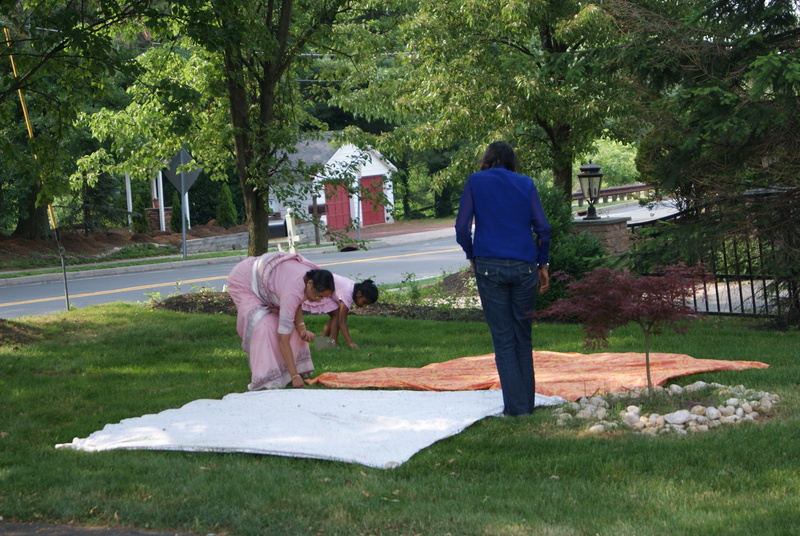 Esha kept exclaiming that she couldn’t believe that these were in her front yard in which I got the opportunity to share that nature provides sacred prasad (holy offerings) to us and we just forgot how to see it. In previous conversations, Esha’s mother had talked about how they had sprayed their lawn in which I took the opportunity to ask, “Now will you not spray your lawn?” Thank you mulberries and Nature for opening up another family to your sacred and special holy offerings. Returning them one step closer to realizing that they ARE nature and no one can take that away! Where can I find these trees Dan? I want to go harvest this Sunday. Any recommendations? look in parks, along edges or right in the lawns, neighborhoods. they are easy to find and once you find a few you will find several around that area because birds disperse the seeds readily. best of luck and let me know if you find them! I loved this post. It’s such a unsung hero, people think of it as a nuisance, but it is a treasure. I hope I happen upon one too. Mulberries are the best. I find them all over in Trenton, totally untouched. Nothin like snacking right off the tree- no corner store necessary. We have alot on our cattle farm. They are a great fruit. But, the key is to get them before the cows,deer,and birds do! I am so excited I read this blog. There are actually 2 Mulberry trees in my yard and Im trying to harvest them without the birds and ground hogs getting at all of them first. I have a handfull that fell with a small branch. Im going to try shaking the tree with a tarp under it. I researched the berries a bit and found I can freeze them. I think its time for a Mulberry smoothie!! you can offer the animals some food that you no longer wish to eat, this way they can get some good food and everyone gets fed. the tarp idea is good, but dont shake too hard or else you will get lots of unripe mulberries. the ripe mulberries come off with barely a touch and barely a shake. mulberry has provided a creative livity for us for the past 20 years here in Barbados in the West Indies and have helped us to create relationships from Cubas to China and beyond. In our zeal and zest for more knowledge of the moriculture ( study of Mulberries) we have created a prize~winning culinary fusion of condiments, preserves teas and drinks that are unsurpassed in popularity. We can’t make enough! Mulberries are truly a gift from God and for Good health and energy, it is our number 1 choice. O discovered a few weeks ago that my backyard is a grocery store of wild edibles! I have mulberries, grapes, strawbarries, poke, lambs quarters, ect ect ect. And the funny thing is, my yard is only bout 30×40 yards big! I just wish it was out in the country and not in the middle of town. Thank you for this post!!! We were just trying to figure out what kind of tree we had in the middle of our yard here, upstate, NY. We moved in last summer and were too busy to notice them or maybe they were gone by then. It’s beyond huge and covered in them to the sky. There are literally thousands on the ground and thousands more in this tree!!! Was just a little nervous about eating them but they smelled great, like mild blackberries. Id be more nervous to eat most of the things in the generic grocery stores! You can identify wild plants slowly and carefully just as you learn to identify a potential best friend. slowly and surely. It programmed into our dna! Thank you Dan …. we were wondering what these fruits were in our yard and a little nervous to try them. We collected them on a blanket and ate them after reading this article, they are delicious! Thank you again! Why does the Nature Conservatory and the state of Indiana post that white mulberries are inedible for humans? I have a volunteer that produces scads od fruit which is mildly tasty. Why the misinformation? Seems akin to the old wives tale about tomatos.